A woman in a blue ball gown shuffles past diners into the middle of a crowded room. The lights are turned down and a spotlight shimmers off the saxophone resting in a harness on her right-hand side. Over the next five minutes the woman, who is just one part of the night’s entertainment, belts out a medley of Tina Turner’s greatest hits – including that sax solo on Simply the Best – to a stunned crowd. No sooner had she finished, another performer – she’s in a black ball gown – trundles out and sings two of her most popular songs. You’d be forgiven for thinking you were at some sort of talent contest. But you’d be wrong. This is how tech conferences close in Kazakhstan. I was invited to spend three days exploring how this massive central Asian country is trying to position itself as a hub for technology companies – and purveyors of exquisite after dinner entertainment. Not many people can say they were there the moment when Valley of Heart’s Delight, the name given to an area famed for its fruit trees, became what we now know as Silicon Valley. The birth of a tech ecosystem is a perfect storm of indigenous science, technology and engineering talent, government funding, venture capital and academic institutions steadily churning out innovations for the aforementioned to get behind. It’s a model that took California the best part of half a century to get right. But other countries are trying to recreate that success in a few years instead of a few decades. It’s easy to see why: the loose geographic area Silicon Valley encapsulates – all of the Santa Clara Valley, the southern half of the San Francisco Peninsula, and southern portions of the East Bay – ranks third globally when it comes to GDP per capita. 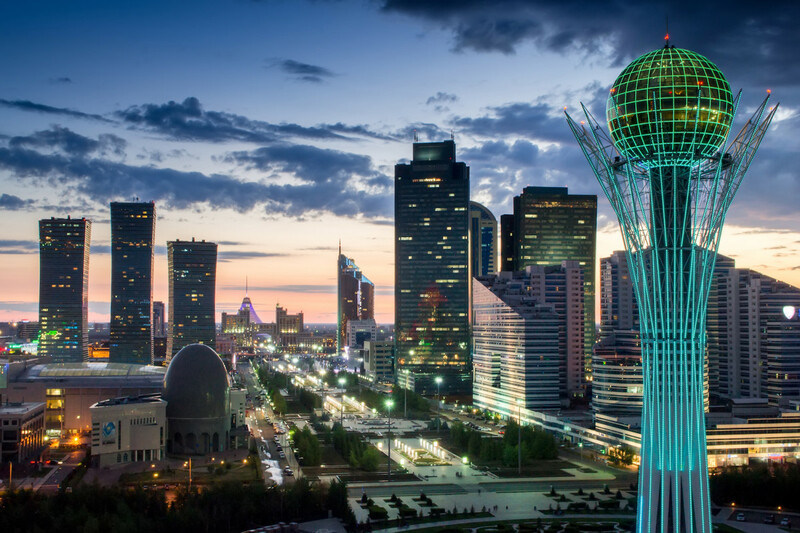 One such country trying to emulate the area’s success is Kazakhstan. The place of origin for a moustachioed journalist – played by a British comedian – who rampaged across America in 2006. But despite this slightly skewed perception of the country and it’s shaky history as an independent – and democratic – former Soviet state, late last year it hosted TechConnect – the largest tech conference in Central Asia. The event brought 300 startups and investors together with 1,500 visitors from the region and further afield inside an enormous building called The Palace of Independence. This is the first thing you’ll notice while in Kazakhstan. The capital, Astana has gone from a regional trading post to a major city in just 20 years. It’s replete with giant squares, boulevards and a cacophony of Asian, Western, Soviet and straight-up bizarre building styles with a roster of famous architects lining up to leave their mark on the icy capital. There is a 200-foot-tall glass pyramid, also known as the Palace of Peace and Harmony. The national archives are in an green egg-shaped dome, the presidential palace is modelled after the White House, only much bigger and topped with a bright blue dome; and there are a bevy of other government buildings whose shapes have drawn comparisons to syringes and cigarette lighters. Our White House is better than yours. With Ben Rooney and Timur Vorona. The former capital, Almaty, located in the far east of the world’s ninth largest country wasn’t regarded by long-serving leader Nursultan Nazarbayev as part of his ambitious plan to turn the remote former Soviet republic into a world superpower. As a result the city feels empty and at times soulless. While many capitals have had centuries to develop a distinct culture and feel, Nazarbaev and his city planners believe one can be built by throwing oodles of cash at it thanks to the country’s epic oil and gas reserves. It’s a theme I would see time and again during my trip. For the conference, The Palace of Independence would be its temporary home. The giant blue steel framed building looks modern on the outside, but when you step through the doors it feels more like a mausoleum, with giant stone walls decked with dioramas of the Kazakh people and their dear leader. The conference was designed to be a showcase for indigenous talent but also a lure for tech companies in neighbouring countries (China, Russia, Uzbekistan and Kyrgyzstan) and places such as Ukraine whose recent political climate has made it a difficult place for startups to do business. The bulk of the startups I met were robotics focused – a legacy of the Soviet Union’s focus on engineering and science. As a result, Kazakhstan has more than 70 universities producing thousands of engineers, mathematicians and IT specialists every year. It also has the Bolashak (Kazakh for “The Future”) program, under which students from Kazakhstan can go study abroad with the state picking up the tab. In exchange, the students have to work in the country for four years, though most seem to stay in Kazakhstan after this obligatory period is over. The program has been going for more than 20 years, with some 11,000 people returning home with a strong grasp of English and a healthy dose of the tech scenes they were exposed to while studying. One such product of this scheme was Indybo, a startup that uses robots to help children learn how to code. The company’s presence at the conference was purely symbolic. I continued my search for local startups. I found Bizmo, a supply chain intelligence platform that monitors the prices of goods and services in the industrial sector. Kazakhstan’s mining and oil sectors are enormous – it produces 35 percent of the world’s uranium – and its oil reserves put it just outside the top 10 producers in the world. So Bizmo is well placed. But as soon as I began speaking to co-founder Roman Gurbanov I noticed the North American twang in his voice. Over the past few years the Kazakhstan government has spent big in the sector. From 2010 to 2014, the National Agency for Technological Development handed out some $47 million in grants and loans to 600 startup projects. The government also established a number of Special Economic Zones (SEZ), in particular, the IT-focused “Innovation Technologies Park” in Almaty, the country’s former capital. Startups inside the SEZ are exempt from corporate tax, land tax, capital tax and may receive a plot of land in the zone for free for 10 years. They can also apply to the government for various grants ranging from $7,000 to $500,000, which could be used to fund research, pay for consulting services, patent inventions, license technologies, train engineers abroad and so on. The state has also built accelerator programs. Currently there are two, TechNation, which started in 2015 and iStartup, which has been around since 2011. There is also a healthy number of co-working spaces in Almaty that double as hubs for experience sharing and networking. But if companies can apply to the government for cash and the government is doing all the legwork for building the ecosystem, why bother with VCs? I managed to track down Nurzhas Makisheb, a Kazakh-born early stage tech investor based in yep, you guessed it, the US, to ask what his position is. Makisheb also went on to highlight the country’s chequered history when it comes to political stability. In December last year the government announced it was going to build its own version of China’s Great Firewall, allowing the state to unscramble and monitor any encrypted data flowing into the country. This month, two people were jailed after they posted content on Facebook that a judge described as, “inciting national discord”. Economically, Kazakhstan’s tenge currency has lost over 50 percent of its value against the dollar since August 2015. The Economist Intelligence Unit is projecting the country will endure a recession for the first time since 1998. The government has also gone to lengths to assure investors that if there are legal issues, international investors can file a lawsuit in an international court in Astana, which would deal with it in accordance to English law. In the latest Global Competitiveness Report, Kazakhstan ranked 22 out of 144 countries on the investors protection rating. That’s translated into more than 30,000 foreign companies setting up shop in the country. “It’s really easy to open a company. It takes you less than one hour officially,” Dias Zhumagalieb, a young entrepreneur I met at the conference told me. For any startup or investor in the West, I would assume the conditions above might keep them out of Central Asia. But it seems others aren’t as cautious. In a region where nepotism, strong-arm tactics and heavy-handed statism are common place, it makes Kazakhstan seem like the best of a pretty terrible bunch. Back at the conference, international speakers occupy three separate stages, all trying to distill a lifetime’s worth of knowledge in neat, ten-minute slots. I was asked if I wouldn’t mind sharing some of my pearls of wisdom on pitching to the media over on the startup stage alongside Ben Rooney, the former European tech editor of the Wall Street Journal. I ran through the normal gamut of press cliches – find out a journalist’s name, don’t just keep sending the same press release, stop calling your startup “the Uber for…” hoping to get some laughs. But none of it seemed to be resonating. I shuffled off stage a tad dejected only to find out sometime later from a local who asked to remain anonymous that no one talks to the press in Kazakhstan. Why I asked? “Because the country ranked 160 out of 180 when it came to countries with a free press,” the anonymous commentator told me. I decided to check out the startup battle taking place on the main stage. Of the 10 finalists competing for the $25,000 first prize, only two were from Kazakhstan. The rest were from Ukraine, Russia and neighboring Kyrgyzstan. Each startup was required to deliver a five-minute pitch in English to a panel of judges. It’s daunting enough having to pitch to a room capable of holding 10,000 people in your own language, but watching the startups gallantly try to remember their notes on each slide and translate it into comprehensible English felt like a strangely apt metaphor for my entire experience learning about startups in Kazakhstan. The country has a lot going for it. It’s the biggest and richest in a region that has India, China and Russia as neighbors – three giant economies that have more than enough cash and people to build services for. They have a solid education system and are actively sending their youth abroad to learn all they can from institutions in America and elsewhere. Engineering talent isn’t a problem and the government is plowing cash into trying to kickstart the tech ecosystem. They also have marching bands that do this. However there are few, if any VCs willing to take a punt on startups striving to corner a portion of the tiny domestic market. Infrastructure is still a way behind – it ranked 58th in broadband speed tests last year and only has one state controlled 4G network. There is zero press freedom and there’s no incentive for companies to build social networks that could see them arrested for violating one of Kazakhstan’s many draconian laws. There are also some serious storm clouds gathering over Kazakhstan’s economy. That crucial mix that allowed Silicon Valley to flourish hasn’t reached Kazakhstan, yet. But, as I stand under a disco ball watching the talent contest unfold in the dining room at the end of the conference, I can’t help but commend Kazakhstan for wanting to build Silicon Valley in a fifth of the time it took to build the original. If half the companies I meet survive the first three years – and the country’s economy doesn’t implode in the process – it’ll give hope to dozens of other countries across the world that investing in the tech industry can be one of the fastest ways to help a country develop.